Tennis is a great sport – and for many people, a local tennis club is one of the main hubs of their social life – but what happens when things go wrong? 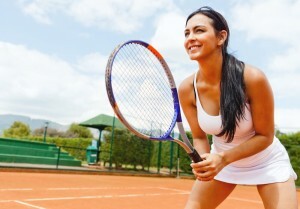 Tennis injuries are more prevalent and diverse than many people think according to Adam Rocchi, Chiropractor, Perth. Below is a list of the seven most common tennis injuries and some top tips on how you can avoid them. If these tips come a little late for you and you are already suffering from a tennis injury, call the practice today on either (08) 61508785 Scarborough or (08) 61508783 Mount Pleasant to arrange an appointment. We can help you get out of pain and back onto the court as quickly as possible! The strong, sudden sideways movements, (especially on a slippery court or when players are tired), can result in the ankle twisting and causing bleeding within the soft tissues and damage to the ligaments. This results in pain and swelling. Strength or length issues of one or more of the 6 muscles in the lower leg are often to blame. Trigenics treatment to address these problems is advised. Wear good tennis shoes that provide correct support for your feet and padded tennis socks for additional ankle support. Be sure to warm-up correctly before your game (your Chiropractor in Perth can suggest appropriate exercises). Finally, consider an ankle brace and balance exercises if sprains and strains have been a problem for you. Muscular strains to the Calf happen when the muscle is stretched beyond its limit, resulting in a tear.Tennis as players have to move very quickly, often pushing off one foot to thrust themselves forward to make a shot and this is when a calf strain is most likely. Top tip? Feed your muscles! A high intake of carbohydrates before your match will help to ensure that your muscles do not run out of the fuel they need for correct contraction. During a long match, a good sports drink can help you to replenish your carbohydrate stores as well as your fluid. A Sports Chiropractor will be able to advise you on stretching exercises that you can include in your pre-match warm up that will help protect you from injury. Tennis involves a lot of jumping and springing off one leg, putting strain on the patellar tendon that attaches the kneecap to the shin. Inflammation of this tendon (Patellar tendonitis or Jumper’s knee as it is often called), causes pain, swelling and heat in the affected area. At the first sign of knee pain while exercising or during a match, you should stop right away! Applying ice and resting the knee will speed recovery. Protect your knee by doing exercises to build up the strength in your thigh muscles. A major culprit for knee injury is a relatively small muscle ( thepopliteus ) which is integral to knee stability under load. Wrist sprains involving a torn ligament or ruptured tendon are common in tennis and often happen when a player swings their racquet to hit the ball and miss! Repetitive movements can also be a problem that causes inflammation of the soft tissues in the wrist, leading to pain. Consult your Chiropractor for advice on possible manipulation of the numerous small bones in the wrist that are problematic due to previous falls, the right racquet weight, handle size and grip for you. He can also advise on wrist exercises and possibly, a wrist support. Wearing good tennis shoes can also help to prevent falls that result in wrist injury. If you had to name one injury associated with tennis, it would probably be Tennis Elbow!Although it can have other causes, as a tennis injury, it is due to inflammation of the soft tissues, tendons and muscles in the forearm. Thisoften occurs when the tone of the flexion and extension muscles in the forearm are mismatched and overuse when hitting the ball with the racquet causes tissue damage; Pain in the elbow area results. Pay attention to your warm-up routine before playing. Your Chiropractor can suggest exercises to strengthen the muscles of the forearm and these, combined with advice on racquet grip size will help avoid the problem. If you have experienced tennis elbow, you will know how painful it can be and might want to wear a special elbow compression strap that reduces the strain on the elbow. The shoulders, particularly on the racquet arm come under strong and repeated stress during stroke play and especially with overhead strokes such as the serve. The rotator cuff muscles that provide stability for the shoulder’s ball and socket joint are the usual candidates for injury. When the stability of the shoulder is affected (due to weakness, tightness or fatigue), the tendons or bursae can also become inflamed, causing pain. Top tip? Make an appointment with Perth Sports Chiropractor Adam Rocchi for investigation into the muscle strength and length of 12 associated shoulder muscles and advise onshoulder stabilisation exercises. Allowing the body to adapt and adjust will pay dividends and prevent injury from stopping you enjoying your tennis. Muscular injuries to the lower back are common due to the rotation required when hitting groundstrokes. One of the more troublesome injuries, more common in younger players is a stress fracture, particularly in the lumbar spine. These stress fractures can develop due to core instability,lumbar locks and the bending backward and rotation involved during a game of tennis. Trigenics treatment and associated exercises to improve core stability and strength will be beneficial in providing protection for the muscles and vertebrae of the lumbar region. In addition, if you are a teenager who has just put on a ‘growth spurt’, be sure not to overdo things when serving as you are in the group most at risk for a stress fracture injury. How Can Spinescan Chiropractic Help? If you are in pain, or experiencing problems with any of the above-mentioned conditions, please call us today on either (08) 61508785 Scarborough or (08) 61508783 Mount Pleasant so that we can help you to get out of pain fast – and get moving again and enjoying your tennis. offers members free use of 13 grass courts and plexicushion hard courts and many other benefits including free adult social tennis, interclub tennis, professional coaching staff, discounted private lessons and social functions. offers a variety of events for juniors and adults to play tennis and socialise. There are 22 floodlit courts (grass, artificial grass and hard courts). Designate one of 5 Regional Tennis Centres in WA by Tennis Australia. ‘Tennis Excellence System’ professional coaching for all ages. offers eight all weather hard courts (seven are floodlit), three Classic Clay courts (floodlit), a clubhouse with changing, shower and toilet facilities, kitchen and bar. Coaching is through Perth Performance Tennis Academy for adults and juniors. offers six synthetic grass and four Plexipave hard courts (all floodlit). The clubhouse caters for members and the local community with a kitchen, bar and entertainment area. Tennis for all ages and abilities, professional coaching, all year round with competitive and social tennis throughout the week and lots of social activities. 9 Superfoods For Athletes to Boost Performance.